Gilbert Fossoun Houngbo is the Prime Minister of Togo since 8 September 2008. 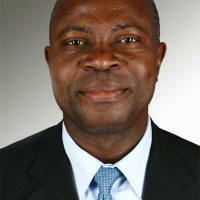 Houngbo holds an advanced degree in business management from the University of Lomé in Togo, as well as a degree in accounting and finance from the Université du Québec à Trois-Rivières in Canada. He is a member of the Canadian Institute of Chartered Accountants. Houngbo was a member of the United Nations Development Programme (UNDP) Strategic Management Team and was its Director of Finance and Administration before being appointed as the UNDP Chief of Staff in 2003. He was subsequently appointed as United Nations Assistant Secretary General, Assistant Administrator of the UNDP, and Director of UNDP's Regional Bureau for Africa by UN Secretary-General Kofi Annan on December 29, 2005. On 7 September 2008, President Faure Gnassingbé appointed Houngbo as Prime Minister; he replaced Komlan Mally, who resigned two days earlier. His appointment as Prime Minister was read out in a decree by Kouessan Yovodevi, the Director of National Television, who stated, "Mr Houngbo is Prime Minister". Houngbo took office as Prime Minister on 8 September. Houngbo was a relatively obscure figure in Togo prior to his appointment as Prime Minister, and his appointment was regarded as surprising. Houngbo travelled to the UN Headquarters in New York on 11 September for a visit to mark his departure from the UN. He met with UN Secretary-General Ban Ki-moon on 11 September, and Ban congratulated him on his achievements at the UNDP. His government was named on 15 September 2008. It included 27 ministers, aside from Houngbo himself: three ministers of state (one of whom was Houngbo's predecessor, Komlan Mally), 20 ministers, two minister-delegates, and two secretaries of state. Houngbo presented his general policy programme to the National Assembly on 16 September. Of the 80 deputies who participated in the vote on Houngbo's programme, 50 (representing the ruling Rally of the Togolese People) voted in favor of it; the opposition Union of Forces for Change voted against it, while the opposition Action Committee for Renewal abstained.